The Yorkgate complex was evacuated earlier this evening after a fire broke out in the Burger King franchise. The complex is home to the Yorkgate cinema multiplex - part of the Moviehouse chain - as well as a Pizza Hut, an amusement arcade, a supermarket, several shops and a bingo hall. At least eight fire appliances attended the scene to try and contain the blaze and stop it spreading. There are no reports of any injuries. Perhaps flame-grilled whoppers will now come off the BK menu? It'll be Alan not in Belfast for the next week, so it's unlikely there will be many posts. So what does Alan in Belfast listen to during the drive into work, on the plane, in the Tube or standing doing the dishes at the kitchen sink? Are the hits going up? 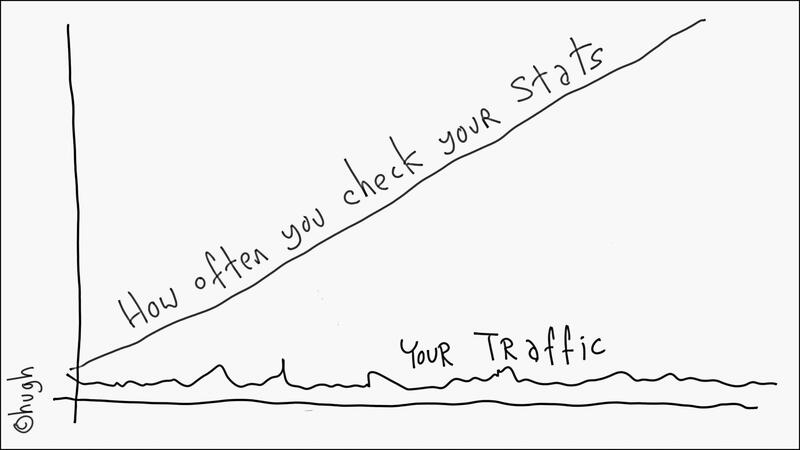 You’ve got a shiny new blog, or a maybe a sudden burst of posting after a fallow period. Damien Mulley and Geared Up’s posts point back to Hugh Macleod’s excellent cartoon. Sigh. They’re remaking (13) Tzameti in English. Why take a perfectly good film and remake it? To get more people to watch it, since the original is in French and most people are put off by the subtitles. I’ve talked about subtitles before. The bad news is that the Sundance award-winning French thriller 13 (Tzameti) is to receive (suffer) a Holywood remake in English. Good news: the original director Gela Babluani will be in charge of the remake. There will be some plot alterations and extensions. Reviewing Tzameti for its UK release in January, the Guardian's Peter Bradshaw remarked that "this compelling film could well be remade by Hollywood. Make sure you see the original now". In the second half of 2005, Ofcom surveyed regions across the UK, and their published findings make interesting reading for Northern Ireland. People in Northern Ireland send the most texts per week – 37 texts against a UK average of 28 texts – and listen to more hours of radio than the UK average. People in Northern Ireland rely more on mobile phones as the only means of making and receiving phone calls (12% compared with an 8% UK average). In Northern Ireland, with a high rural population, more people live further than 5km from a broadband enabled exchange than the UK average and are therefore less likely to receive higher speed broadband services (26% compared with a 14% UK average). Lower take-up of digital TV in Northern Ireland (52% compared with UK average 65%) is consistent with lower than average availability of DTT and cable, and consumers have higher levels of uncertainty around whether or not they are likely to take-up this service in the future (21% uncertain compared to UK average 10%). Cost may also be an issue. Northern Ireland has significantly lower take-up of digital radio services (21% vs. UK average 32%). Evidence indicates that listeners are happy with their currentanalogue services or not interested in digital radio. Only the three main TV transmitters at Divis, Limavady and Brougher Mountain have been digitally enabled. Wales has similar coverage to NI, but has the highest take-up in the UK. Digital cable services from ntl are available to 30% of people in NI (in the more densely populated areas), compared to a UK average of 45%. 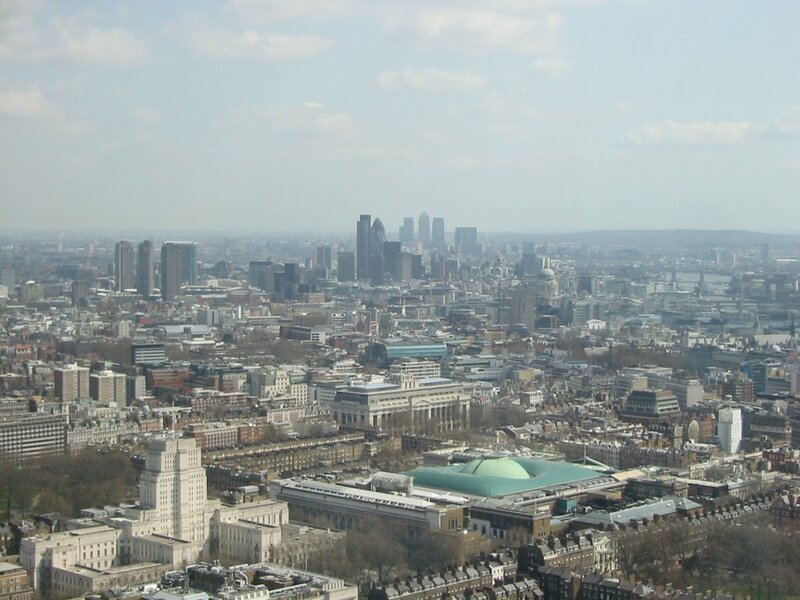 other than in London, there are more text messages sent than phone calls made from mobile phones. A couple of weeks ago, I posted a couple of stories about watching TV on mobiles and on PCs. 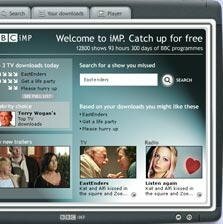 Following their catch-up TV trial, the BBC planned to rollout the MyBBCPlayer, combining the download elements of the iMP trial with live streaming. And this week, in a fit of trendiness, the Beeb have now announced that it will be called the BBC iPlayer. Didn’t take an iBrain the size of an iPlanet to come up with that iName! King of the Chavs - taken for a ride? 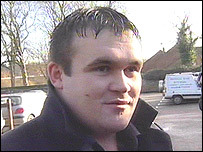 On the way to bed last night I caught Channel 4’s documentary on Michael Carroll: King of the Chavs. When Carroll won £9.7 million on the National Lottery in November 2002, there was uproar amongst those who cared (mainly red-top tabloids). Only 19 years old, Michael led a colourful life, tagged for being drunk and disorderly, a four-month sentence for aggravated vehicle-taking, driving whilst disqualified and criminal damage. His winnings didn't help him settle down. And, if anything, the continued media interest in his life and behaviour must be partially responsible for fuelling his continued controversy. Keith Allen last appeared on our screens as the narrator and Pilate in Manchester Passion. His role last night as pretend-confidante and snipping judge of Carroll. Allen's commentary tried to give Carroll the benefit of the doubt. Perhaps he wasn't the lout that the media portrayed? Perhaps not all the reporting was true? Yet, Allen continually mocked Carroll in the documentary's voiceovers. As the programme drew to a close, and Carroll croaked some lyrics quickly penned by Allen in a garden recording studio, it seemed like Carroll might actually be a tame character after all. The interruption to the closing credits scotched that idea – jailed in February 2006 for affray and threatening teenagers at a 2004 concert with a baseball bat, along with other more recent allegations that will have reset any audience sympathy. I'm sure Carroll regrets taking part in the programme. Keith Allen's commentary, the editing and Carroll's own subsequent behaviour have further damaged his image, and reaffirmed his role as villain. Perhaps Channel 4 and Keith Allen need to be careful that they don't join him? Each time I check the Alan in Belfast logs, I'm amazed at the search terms that some people have typed into search engines to reach the site. I seem to pick up a lot of hits for Titanic Studios and the new Gourmet Burger Bank since they don't have their own websites. Amazing what you can learn while reading the paper on a plane stuck on a Belfast runway due to fog at Heathrow! Below are just some of the tantalising facts that I picked up this morning. Tony Blair's trip from 10 Downing Street to Buckingham Palace on 5 April 2005 to ask the Queen to disolve parliament cost the Labour party £53.46. The party forked out a further £299 during last year's election campaign to hire Star Trek costumes so that Labour activists could follow around the Conversative candidate John Redwood and capitalise on his "The Vulcan" nickname. And I can't fail to mention the £264,000 to buy John Prescott's battlebus, and £75,000 for adapting it. Surely he could have got 2 Jags cheaper? In a bid not to be outdone by the Complete Works Festival of Shakespeare’s writings that I posted about previously, politicians from across Northern Ireland are coming together in May to re-enact scenes from our political history. And no doubt the MLAs will vote themselves a pay increase too - something they have a history of doing. Tickets not required. It will be simulcast on all local TV and radio news bulletins. In the twelve months leading up to April 2007, the Complete Works Festival will perform everything Shakespeare wrote that was longer than a shopping list in Stratford-upon-Avon. The first time that this has ever been done under the umbrella of a single event or festival. New York-based theatre company, Tiny Ninja Theater, performs Hamlet for the first time in the UK using an inch-high cast of small, plastic ninja figurines. Multi award-winning Teatr Piesn Kozla (Song of the Goat Theatre) from Poland, presents its current work in progress, based on Macbeth. Forkbeard Fantasy’s production of Rough Magyck which looks for the supernatural in Shakespeare using mechanical sets, film, cartoon and puppetry. Yellow Earth in association with Shanghai Dramatic Arts Centre give King Lear a modern spin in its bilingual (English and Mandarin) production. Chekhov International Theatre Festival in association with Cheek by Jowl performs its all-male Russian version of Twelfth Night. Cardboard Citizens applies its unique brand of theatre to Shakespeare's supposedly unfinished text Timon of Athens. and lots, lots more from Brazil, Germany, India, Japan, Kuwait and South Africa. Something for everyone, and then some. Linked to here - but (c) Telegraph Group Ltd 2006. Free DVDs? What will Belfast Telegraph give away? As I walked past the pile of Belly Laughs at the check out recently, the word FREE screamed out from the front page. With free CDs a thing of the past and the recent rash of newspapers giving away free DVDs, what title would the Belfast Telegraph choose bestow on its readers? Ryan’s Daughter? Titanic? Perhaps a political thriller? No. None of those. 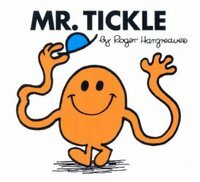 Instead, a choice of Mr Men or Little Miss books! Cut out the voucher, tick the box, tape 50p to it, and send it in. The giveaway offer didn’t generate the I’ll-buy-one-of-those-to-get-that reactions in me that the Belly Laugh hoped for, but it made me smile. And if Little Miss Sunshine had been a little older, then maybe I’d have bought one in a flash. No lion, no witch, but today certainly featured a wardrobe. Having picked up a bargain wardrobe, how to get it transported back to the house. Pay £10 for delivery? No thanks. I'll put it in the Polo. 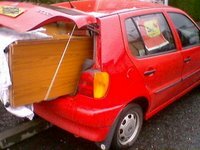 Having previously brought 9 foot ladders home in the little red car, I was pretty confident that the wardrobe would fit in somehow. And it did. Though the Polo didn't help get the wardrobe up the stairs! Will Radio 4 be less tuneful after tomorrow? 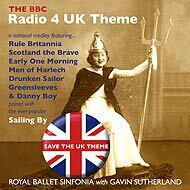 According to the BBC’s history, since 1973, Radio 4 has played Fritz Spiegl’s specially commissioned UK Theme at 5.30am each morning, when Radio 4’s programmes take over from the overnight World Service content. Fritz Spiegl (1926–2003) was an Austrian whose Jewish/Catholic family fled Vienna to escape the Nazis. Fritz and his sister were sent to England. As well as composing UK Theme, he regularly appeared on Radio 4.
ending with a full orchestral version of Rule Britannia over which a solo trumpet plays the Trumpet Voluntary. Quite a lot to squeeze into a piece exactly five minutes long. Ingenious. "a pacy news briefing, read by one of Radio 4's fine team of news readers." Now many a morning, I've been in my car on the way to an airport when UK Theme has been playing – but never once have I been tuned in and heard it. For me, Five Live wins at that time of the morning, with mildless business news to keep me awake on the roads. Apparently the loss of UK Theme it’s a crisis. Society in general, and culture in particular, will evidently be poorer after tomorrow. Since the announcement in January, Radio 4 fans have been up in arms, writing letters of complaint. MPs have raised Early Day Motions and even raised the subject in Prime Minister’s Questions – is this a good use of our elected representatives time and energy? It you’re reading this post 5.35am on Sunday 23rd, don’t despair. You can still hear what’s missing at 5.30am. But to get the full experience, promise me that you’ll set your alarm clock for 5.30am and then get up and listen to it at the link so thoughtfully provided by the BBC. I, for one, won't have my alarm set for the morning. Having loaded up yesterday's footage onto my PC, Only now we discover that one camera shot in 16:9, while the other was 4:3 … and Pinnacle Studio v9 doesn’t allow mixing footage of two different aspect ratios. And if you use Pinnacle’s built-in conversion from 16:9 to 4:3 it stretches rather than adding black strips (letterbox) at the top and bottom. 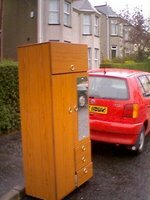 Any conversion ideas gratefully received! Yesterday we spent a few hours filming voxpops in the centre of Belfast to be used at a youth event in June. Used two cameras, so that we had a variety of footage, and more scope for editing the content down to the few minutes of material we need. We even got to interview a celebrity … though he passed on most of the questions! 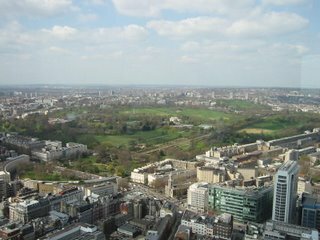 As mentioned in my earlier rant about getting to London yesterday, we had lunch quite high up, and the views were spectacular. 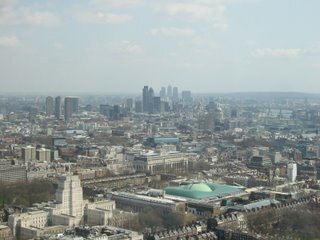 In one direction you can make out the financial Square Mile - with St Paul's Cathedral and the Gherkin - and Canary Wharf (London's highest building) in the background. 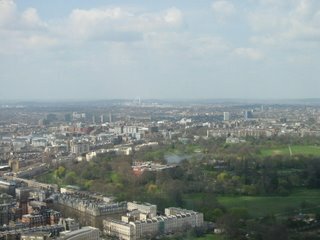 The River Thames is over to the right. 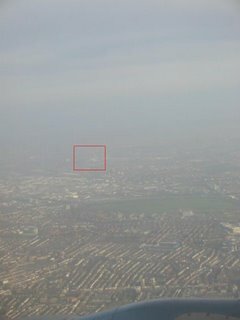 Moving around, the new arch towering over Wembley Stadium can be seen (at lot more clearly than the shot from the plane). Only when you get up high (or look at a map!) 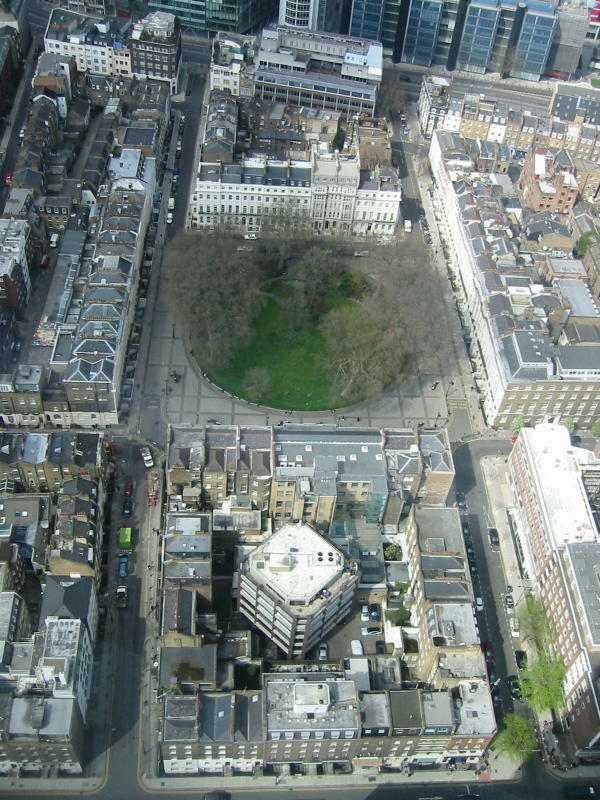 can you see that London still retains huge green parks encircled by really dense building. 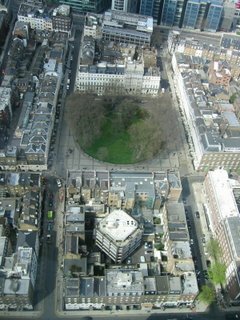 Perhaps an effect of the Second World War Blitz, I was surprised to find that parts of the city are built it blocks, with parallel roads. When walking through the streets at night, it had always seems so higgledy piggledy, and yet there is great order. There should be a architectural competition to see who can design the most stylish roof. 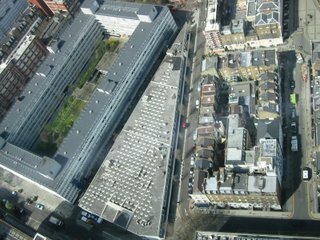 From up high, you can pick out the most incredible detail - whether air conditioning units, or flats being built on top of the roofs. All I wanted to do was go to London on Tuesday for the day, to attend a talk on Agile Delivery. Some say that travel is all about the journey, others rave about the destination. Still others might feel that travel is like being continuously on the verge of a rant. When you only fly occasionally, I guess the irks of moving about don't matter so much; but when you go through an airport on average more than once a week, it grinds you down. 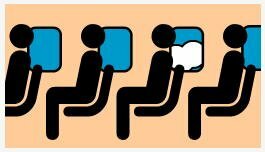 The first trick is to get checked-in as early as possible (preferably before leaving your house), and get a seat assigned. bmi's online check-in was unavailable on Easter Monday afternoon. So no printing out the boarding pass at home and going straight to security in the morning. But it's still worth getting a seat reserved - helps to get off faster at the far end. The call to telephone check-in took an agonising 10 minutes, but successfully got me checked-in, allocated aisle seat 11D. Up at 5.20. Yawn. 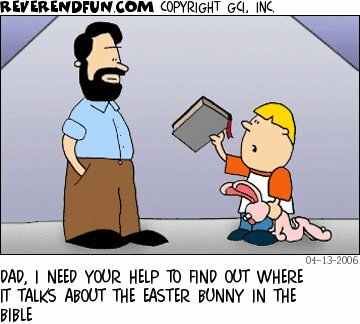 Is Easter really over? Get to the airport, queue up at the self service machine to get a boarding pass printed. 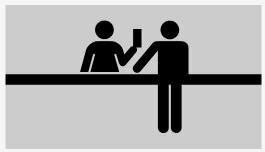 Only it doesn't want to cooperate, and directs me to the real check-in desks. Queue for another 10 minutes, wait three at the desk, and hurray ... boarding cards in hand for my flight, and the return one too! But seat 11D is no longer mine. They've moved the curtain separating business class from cattle class so I'm further back in a window seat with a view over the wing. Got searched going through security, and they decided to go through every last pocket of my laptop bag, swabbing for explosives! Walking down the aisle towards my seat - business class is half empty - no way they needed the extra five rows. 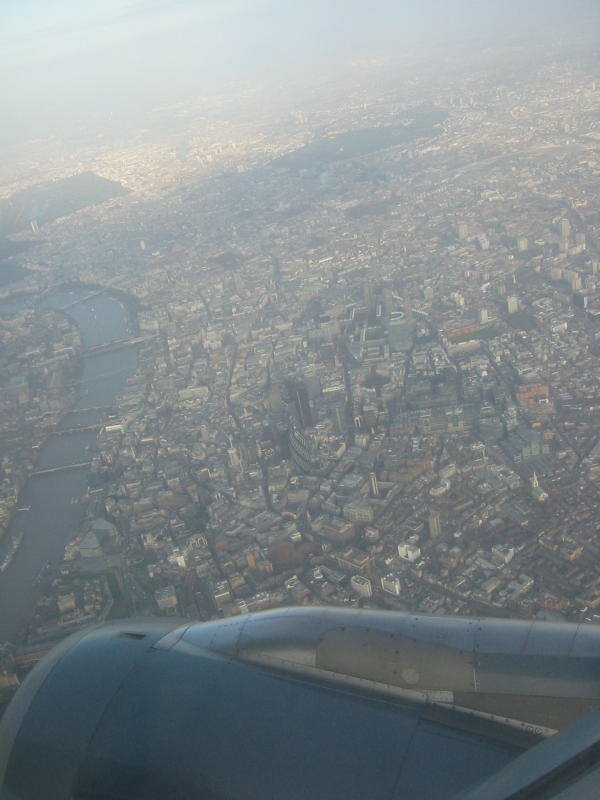 Smooth flight, circled over central London for ten minutes (window seat came in handy) and landed a full 25 minutes early. 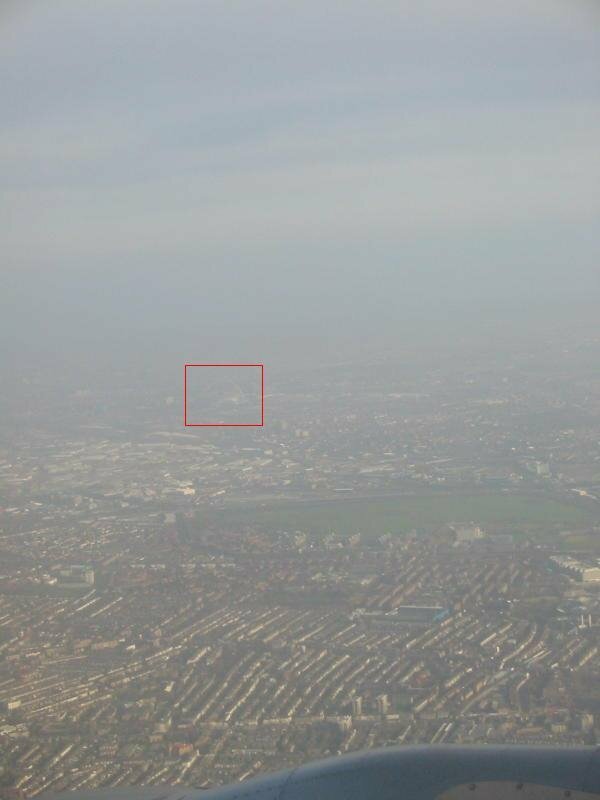 You can just make out the arch over Wembley Stadium. And to trump it all, I've forgotten my work ID card, so getting into the building at the far end will be anything but straightforward. At least I can only blame myself for that. UPDATE - After a security search miles stricter than the one at the airport - ever had to remove the pens from your jacket pocket because they made the scanner ding? - I got inside. 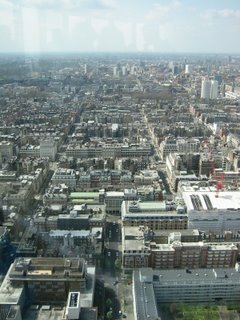 And although the meeting was on the ground floor, lunch was served up near the top, and the view was spectacular ... will post the evidence soon. Photos now posted. Following on from yesterday’s walk around Stormont Estate. On a good dry day, it’s well worth an explore. Other than the very steep main driveway up from the Stormont Road to Parliament Buildings, it’s a pleasant walk that won’t puff you out. Expect to meet lots of East Belfast locals walking their dogs. Further on down from the hill from the sculpture of the hugging couple (“Reconciliation”), there’s a crouching woman on a plinth. 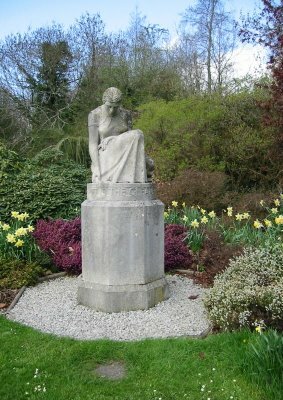 The inscription reads "Thrift is the gleaner behind all human effort". (A gleaner is someone who picks up grain left in the field by the harvesters.) And Googling for the inscription led to a single page containing a poem called Symbols by Stuart Butler. Another bit of not-terribly-well-documented-or-explained history hidden in the middle of Stormont. I’ve mentioned East Belfast in a couple of previous posts (educational vandalism and gourmet burgers). 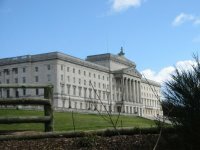 Stormont estate – the home of the Northern Ireland Assembly and lots of busy civil servants – is in East Belfast. Probably better known to some as the venue for George Best’s funeral service. During her time as Secretary of State for Northern Ireland, Mo Mowlam arranged for a children’s play park to be built on the expansive grounds, along with a fairly extensive set of walks through the woodlands. So other than the fenced off civil service buildings, Stormont is now very much open to the public. If the local political process doesn’t reignite, we may end up with Stormont being more famous for the play park than its political role! Walking through the estate this afternoon, I took some snaps in-between the dark clouds and rain showers. 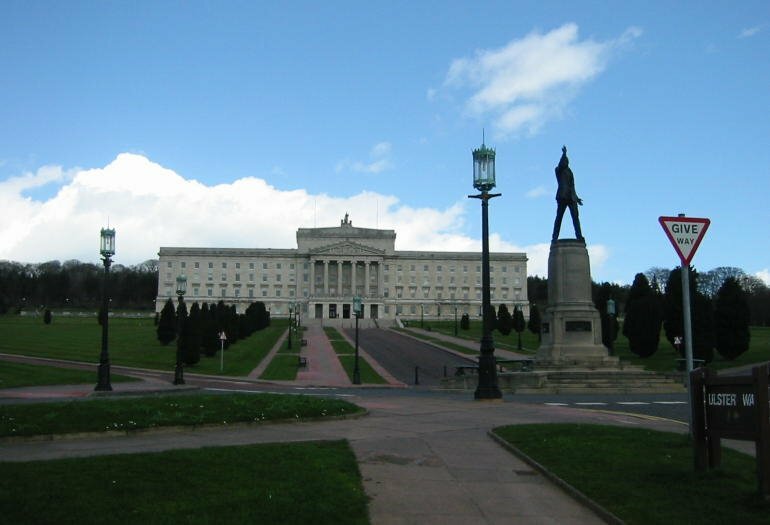 Northern Ireland Parliament Buildings (known as “Stormont”). You can see the status of Carson in the foreground. Interesting that they chose to place both Give Way and Ulster Way (it's a walk) signs there too! 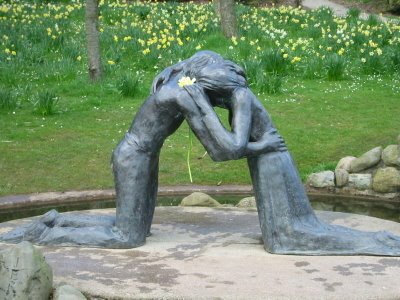 RECONCILIATION by Josefina De Vasconcellos. Presented by Coventry Cathedral and Sir Richard Branson. 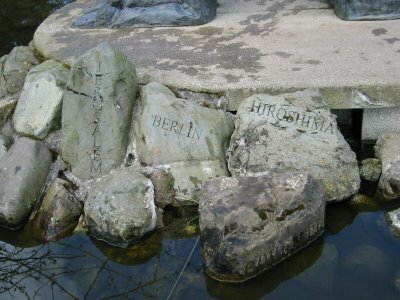 Identical sculptures have been placed on behalf of the people of Coventry in Hiroshima and Berlin. 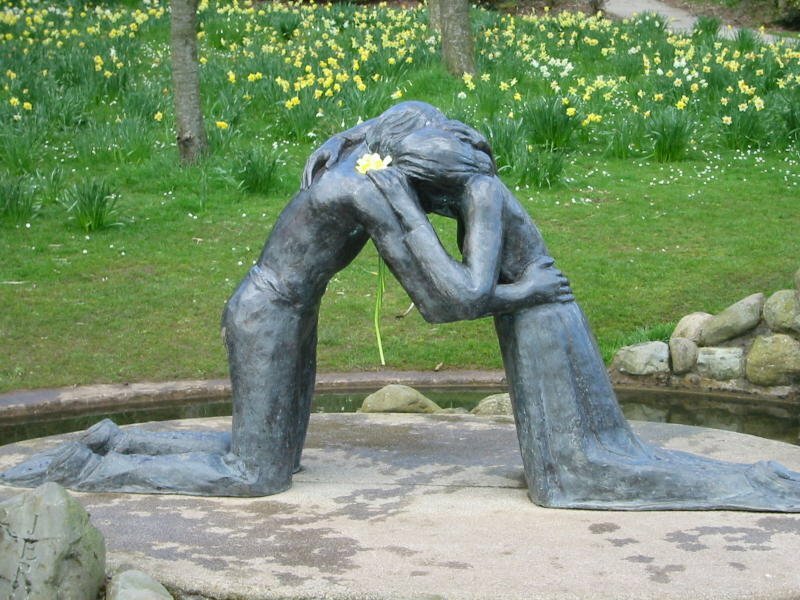 These sculptures remind us that human dignity and love will triumph over disaster and bring us together in respect and peace. UPDATE: If you've read this and been to Gourmet Burger Bank, leave a comment and let me know what you thought of your meal. It did get better!!! Given that this blog is called “Alan in Belfast”, all this talk of Manchester and Segwaying across the USA needs to come to a stop! At last, there’s somewhere to give Bennetts a run for their money on East Belfast’s Belmont Road. Bennetts is packed out most lunchtimes, so there is plenty of trade to share around. and they’ve gutted a bank to create a warehouse-feel, with heavy wooden furniture and off-white (light grey) walls, leaving the cash machine still in the wall outside to point to the building’s previous occupants. They offer about fifteen different types of burger – beef, duck, venison, as well as vegetarian alternatives – and some salad dishes. These aren’t fast food burgers. Think instead of a big hunk of meat, cooked, sitting on a toasted bap, piled high with salad, thick cheese, and with a wooden skewer holding the 4 inch-high creation together. A burger will set you back between 6 and 8 pounds; chips – chunky hand cut or thin – another £2. It was quite busy at 1pm on Good Friday when we called in, so we sat on the comfy sofas in the holding area perusing the menu and order a drink. After a while we moved to a table ... but no one could take our order. “You’re in the queue for ordering, there are other people ahead of you.” Turns out that although the waiters and waitresses can serve food and take drink orders (presumably to keep you in the building! ), only one guy can come alongside your table to scribble your order onto his magic pad. For the record we ordered Duck burger, The Works, and shared a chunky chip. Forty-five minutes after arriving, still no food on the table. When it eventually arrived, it came with onion rings, an apology, and the news that the meal was on the house. The food was excellent, well cooked, tasty, good flavoursome ingredients, if a little slow. So despite the bad start, I’d recommend you give the Gourmet Burger Bank a try. But go early before the main lunchtime rush! 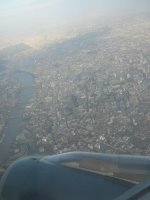 Update from 9 May - we went back! Check out Iain Anderson’s short film – airport - a journey told without words using the symbols used in airports the world over. It’s short, clever and well worth a watch. And like 10 mph (which featured in an earlier post), it has shown at a film festival too, part of the Oz Digital Shorts programme at the Sydney Film Festival last June. Told without words, it requires no translation or subtitles (spoil sports!). The entire film uses AIGA’s public domain airport symbols to tell the story. Follow the central character into the terminal, through the airport, do a bit of shopping, and settle down onto the flight. I posted last night just before BBC3 broadcast the live passion play from Manchester. At home, babysitting my young daughter, and unable to get out to our church's Good Friday service, I sat down at 9pm. It was enthralling to watch and listen. The situations and emotions from the "original" (or first) Good Friday are the same situations and emotions that play out in our lives, and are picked up and represented in contemporary music. Pilate and Jesus each sang the line "Because maybe you're gonna be the one who saves me?" from Wonderwall, and it rang true. Keith Allen - the presenter - as the common man, taking on the role of Judas. Mary longing for Sunshine After the Rain. And the leap forward to the resurrection at the end. Powerful. True to the story as told in the Bible too. Looks like this year's licence fee was worth paying. UPDATE: Saturday's Guardian carried a review by Simon Hattenstone: Day that Jesus came to the Arndale Centre. 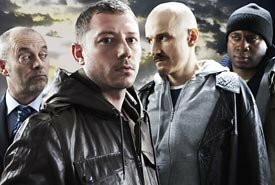 FURTHER UPDATE: Tuesday's online Broadcast magazine news reports that BBC3 grabbed 3.2% of the 9pm audience with the Manchester Passion. That's an impressive 539,000 viewers - up on the normal 175,000 (0.99%) who tuned in on previous Friday nights this year. 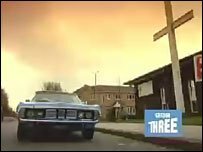 UPDATE GOOD FRIDAY 2007: Programme was repeated again a year later on BBC Three. Passion plays and passion parades have sunk from our local culture, though they remain part of the Easter traditions and celebrations in other parts of the world. In the spirit of the previous two Flashmob Operas – the first was held at teatime one evening amidst slightly bewildered crowds at London’s Paddington Station – the BBC is staging a Passion play across Manchester tonight (Friday) , to be broadcast live on BBC3 at 9pm, and repeated on BBC2 at 11pm. 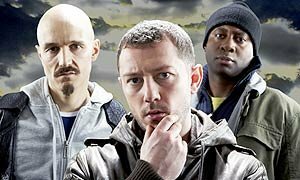 While the event will be presented by actor Keith Allen (seen recently in Bodies), Denise Johnson (vocalist in Primal Scream) will play Virgin Mary, Tim Booth (lead singer of James) plays Judas, Darren Morfitt (Dog Soldiers) plays Jesus and Nicholas Bailey (Dr Antony Trueman in EastEnders) plays Peter. All I can say is that they are not doing a Christian service, it's a piece of contemporary theatre which is going to get people thinking about the story in modern terms. It's going to come from the streets with the sounds of traffic and people bustling around and it will make people think about this story in a new way. It's going to get things rumbling – it's going to be brilliant." 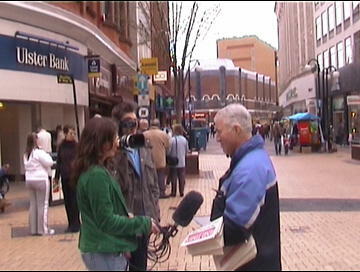 "We are working with the BBC on this and are very pleased to be taking the good news of the gospel onto the streets of Manchester. If anything, something like this can translate the old story into new terms." And spare a thought (perhaps even a prayer) for the technical folk behind the event trying to make it all come together. With the big differences in the delay of the feeds from the fifteen cameras - some wired, some wireless – never mind the radio mics being used across the city, getting everything back in-sync will be complex. Then there's the songs that need to cope with the unpredictable delays that will hit the parade, and the director's desire to be heard over talkback by the cast and crew - many of whom are several miles away from him. Watching TV on your PC? A lot of people now have PC tuner cards, and an increasing number at using PVR software to replace their aging video recorders. Following on from the earlier posting about watching live TV on your mobile phone, I bring news from the BBC who trialled iMP with 5,000 broadband users between November and February. Their Integrated Media Player offered a catch-up service, downloading TV and radio programmes to the user’s PC. But with the restriction that the programmes must be downloaded and watched within seven days of transmission (due to the rights deal struck with Pact, the UK association that represents the commercial interests of independent media companies), enforced by DRM. The stringent seven day restriction may explain why the results show that over a three month period, the 5,000 trialists only downloaded 150,000 programmes - that’s about 30 each, or one every three days. Not a lot. Extending the seven day window may not be possible – though the BBC’s Ashley Highfield is reported to be investigating an adjustment to keep the seven day download limit, but then allow it to be kept until watched once. With the trial over, the next step is the MyBBCPlayer which combines the download elements of iMP with streaming. But it must pass the BBC Governors’ public value test before the public will see it. And if you want to hear the view of someone in the media industry who is actually producing mobile content, listen to Peter Bazalgette on the 7 April edition of MediaGuardian’s podcast (podcast feed, iTunes link) where he explains why TV on mobile phones is the next big thing. Give up your job to ride 10 mph across the USA? Feeling burnt out by the rat race, Josh Caldwell and Hunter Weeks stepped off the corporate treadmill and quit their comfy corporate jobs. Some of might feel jealous at this point. Some might even dream of retiring a few years early - or taking a year’s unpaid leave - to go travelling. But what would they do instead of the daily grind? Ride a Segway across the USA, chart their progress on 10mph.com (the Segway’s maximum speed), and then edit their video footage into a film? Unlikely, but true. You can read all about the road trip expedition on their website and even watch the film’s trailer. After rather a lot of battery changes, and hospitality from strangers along the route, they made it from Seattle to Boston, even extending the trip an extra few miles to drive up to Segway’s HQ. Over the last year, the 200 hours of footage has been edited down, and the finished product is now being previewed at film festivals across the US: Vail, East Lansing (where it won first place in the documentary competition) and Longbaugh. The story is unique and will inspire many with the bold decisions Hunter and Josh made to pursue their dream. Their use of the Segway to travel across the USA creates a modern day, twisted, and very slow road trip, which acts as the perfect catalyst to their transformation as individuals. They become filmmakers and more importantly they learn the essence of what life is all about. But it's not without challenges, risks, and sacrifices. Personally, I found it fun keeping track with their progress across the states – and I was just a little bit jealous that they had the guts to through with it. And I even have a 10 mph T-shirt to prove it! Belfast is overrun with tourists … ish! 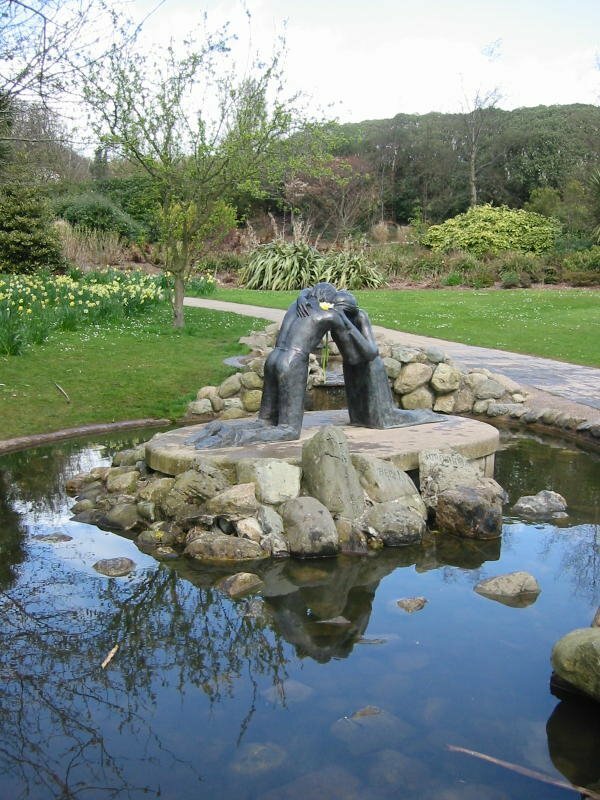 Good news … A massive 6.4 million people visited the city of Belfast during 2005. (That includes people living outside Belfast but in Northern Ireland coming up for a day’s shopping.) And of those, 1.2 million visitors came from outside NI, while 1.17 million stayed over for at least one night. Those figures are up between 8-10% on 2004. Bad news … Pity that the Belfast Visitor Centre faces a 85% reduction in budget this year (down from £1 million of EU peace money to about £150,000). The 2006 visitor’s figures should be strong too – particularly given the boost that the 4000 competitors in this week’s World Irish Dancing Championships being held in Belfast Waterfront Hall will bring, along with and their mothers. The Belfast Hilton will be celebrating too - it looks packed to the gills. Would you watch TV on your mobile? Technology continues to move at a frightening pace. Ten years ago, portable CD players had taken over from cassette-based Walkmans. Today, MP3 players (particular iPods) have captured the listening-on-the-move market. A fair number of mobile phones now have FM tuners built into them, or available as a headphone add on. But do many of us listen to the radio while commuting these days? Dodgy reception, interruptions, unable to go back and hear that bit again … Surely most people have moved to MP3 music (and even podcasts) to get the flexibility we require? There have been two mobile TV trials in the UK recently. These are about broadcasting live TV to your mobile phone – distinct from downloading your favourite drama content from Apple’s iTunes. 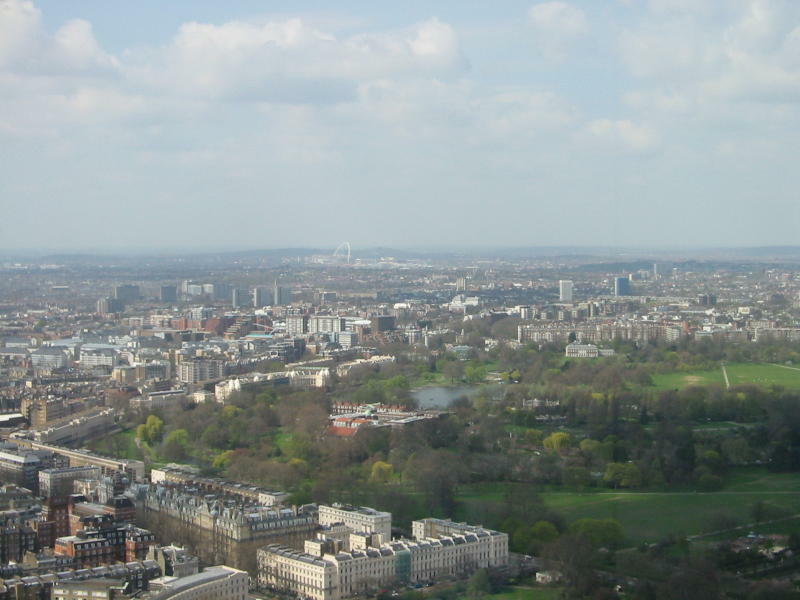 O2 (along with NTL) gave 375 residents in Oxford a Nokia 7710 phone, capable of picking up the 16 TV channels being broadcast locally using the DVB-H standard. Virgin Mobile (working with BT Movio) picked off 1,000 customers in the M25 area, offering them 50 digital radio stations and just three TV channels using spare DAB frequencies. 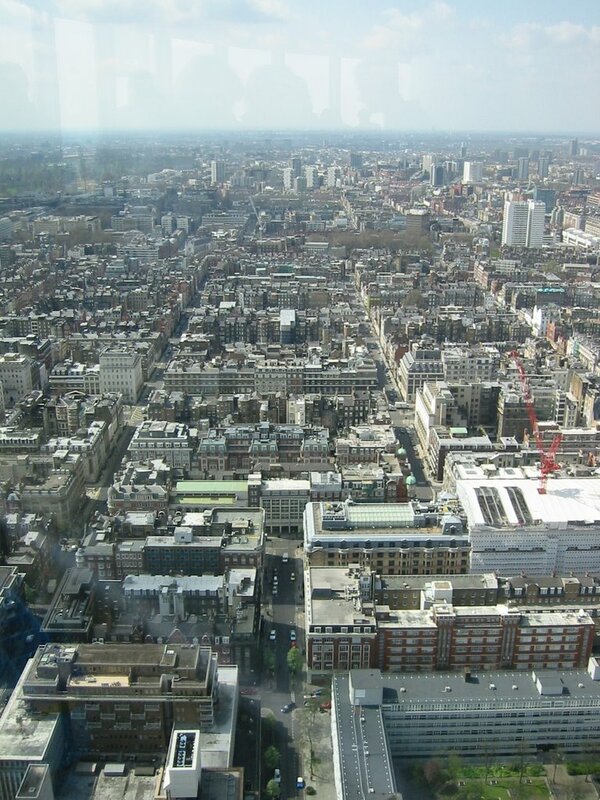 So would you be willing to stop looking out the window and sit hunched up focussed on your mobile’s screen? The statistics from the trials are intriguing. Turns out that people don’t always prefer to watch the biggest available screen: the handy form factor of a mobile-based TV can be an overriding factor. In the O2 trial, a massive 36% watched mobile TV at home, and 18% watched during breakfast! Lunch break viewing entertained a further 15%. On average, trialists watched for 23 minutes at a stretch; and some lasted as long as 90 minutes. O2 viewers watched on average 3 hours per week. In comparison, Virgin Mobile/BT Movio trialists watched only 66 minutes of TV per week, and 95 minutes of digital radio. These were technology trials, so no one had to pay. The prospect of paying between £8 and £12 a month was deemed "reasonable". The lack of an EPG (Electronic Programme Guide) and short battery life were identified as problems. Mobisodes – 5 minute catch-up episodes of soaps etc – were not very popular with the trialists. Music videos went down better. So when will these be serious options to further weigh down our pockets and bags? DVB-H relies on ultra-high frequencies that won’t be freed up until after the analogue TV switchover to digital completes in 2012. So O2 need to find a different technology if they want to go to market soon - or just stick to 3G streaming instead. 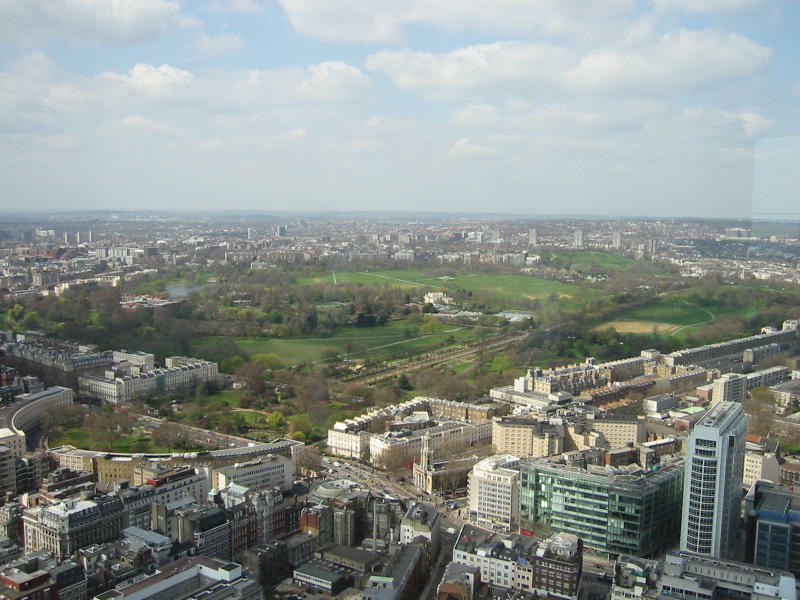 The BT Movio solution trialled by Virgin Mobile replies on the DAB L-band frequencies, which are active and available now (used for bog-standard DAB radio), and they are expected to launch commercially in Summer 2006. Will you be amongst the subscribers? 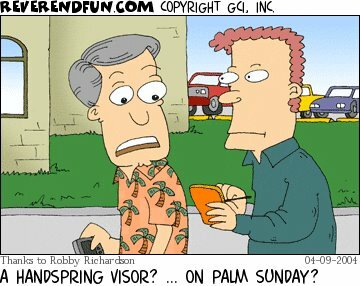 Would you be seen dead watchinhg TV on your mobile? 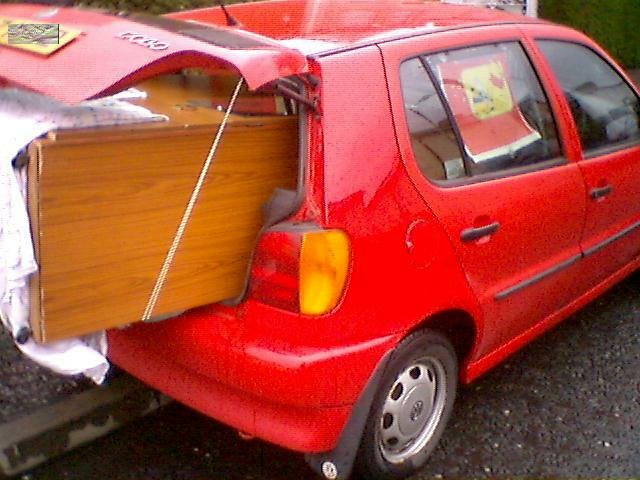 Do you really want live TV on the move? The local radio bulletin this morning heralded the depressing news that just under 1,000 children at Strandtown Primary School in East Belfast have been told to stay at home today after 17 classrooms were wrecked by vandals over the weekend. Drunken youths are reckoned to have broken into an art classroom around 10.30pm on Saturday night, with damage caused to computers, books and pictures. Condemnation from across the local political spectrum. With shrinking budgets across Northern Ireland’s education boards, extra security and unnecessary repairs are the last thing that schools need right now. East Belfast struggles to find it’s positive voice, and struggles to find things to be proud off. Only a month ago, racist slogans along with excrement was daubed inside St Colmcille's Church, just around the corner from Strandtown Primary. George Best became the hero and son of the area, yet seemingly comes complete with more downs than ups in his life. Though with the renaming of Belfast City Airport in May, George Best will soon have as many ups as downs! The Titanic is famous – but for all the wrong reasons. The Stormont Assembly has been suspended longer than it has been sitting, and the latest proposals aren’t too hopeful. The Narmia Lattern parade through the streets of East Belfast as part of Belfast's CS Lewis festival was pretty successful. Credit were credit's due. The Department for Social Development recently announced £33million of funding to be pumped into deprived loyalist areas in Northern Ireland, including East Belfast (Lower Newtownards Road), as part of the Renewing Communities Action Plan. Drunks vandalising classrooms and pulling apart the fabric of their local community won’t help meet this target. 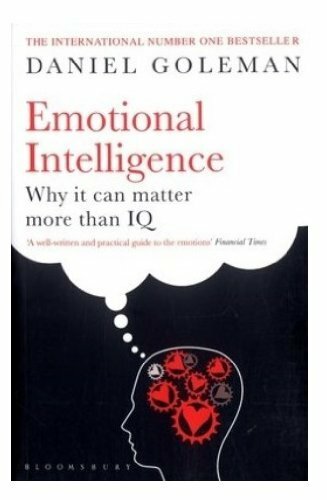 It sounds encouraging to say that I’ve now got to the end of Part 1 of Emotional Intelligence; less impressive to say I’ve read the first 30 of 310 pages. So what has Alan in Belfast picked up? It’s been a bit like a quick revision of Blink (which I reviewed earlier). Lots of content about the architecture of our brains: neuroanatomy, perhaps even neuroscience. There’s an explanation for how we can rapidly make an emotional response (perhaps fight of flight) via the amygdala, while the visual cortex does a bit more processing before it can rationally explain why we might want to react. But these emotional memories can be unreliable, as our environment may have changed, and the old reaction may no longer be appropriate. Amongst colleagues in work, we often refer to beepilepsy: a condition affecting anyone who has been on a 24 hour support rota with a pager. As soon as they hear a beep, they perk up, look around to where the noise came from, and their heart starts pumping faster. On hearing a beep, they react as if it was a middle-of-the-night callout, even though they’re sitting in a café, or at their desk. Particularly distracting for sufferers when they work in an open plan office surrounded by beeping devices. But it's neither a fast nor a terribly enjoyable read. But despite Nelly's encouragement to give up in favour of something better, I'll persevere just a little longer. Part Two, here we come.